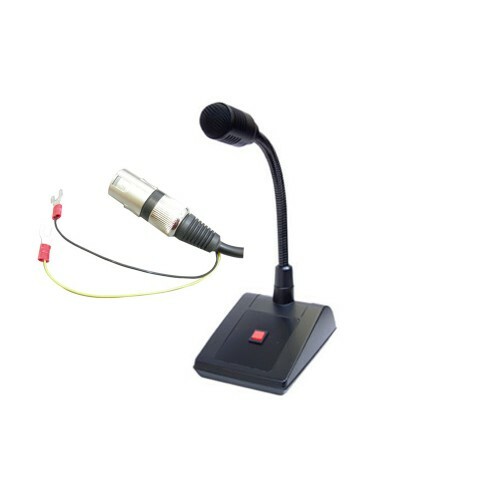 A generic range of wired desk microphones has been manufactured to compliment the majority of public address amplifiers. The series comprises single zone (with a range of different fitted plugs), 2 zone, 4 zone and 8 zone units which are also available with either 4 way or 8 way switching relays. The Signet 1AX is a desk paging microphone with a single press-to-talk button and is fitted with an XLR plug for signal and access pair connections for priority switching Desk paging microphone. Single zone press-to-talk button. Fitted with an XLR plug for signal and and access pair connections for priority switching.